Five Women Five Journeys – How Different Are We? 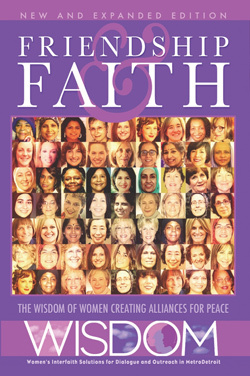 This unique WISDOM program features personal stories of women of different faith traditions – how their childhood impacted their beliefs today, what the challenges are for women in their faith tradition, what parts of their religion are misunderstood, how reaching out to someone from a different faith has enriched their lives. 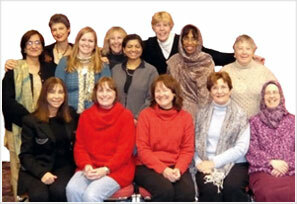 To inquire about a Five Women Five Journeys Program for your organization, contact Paula Drewek at Drewekpau@aol.com. Contact us to book WISDOM interfaith presentation! 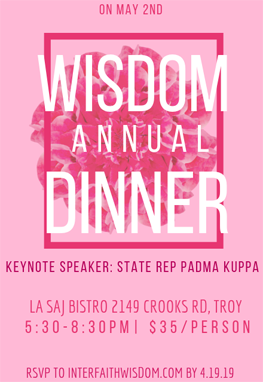 WISDOM interacts with the community through its educational programs, speakers bureau, its signature program Five Women Five Journeys, and partnerships with many faith communities and houses of worship. By partnering with nationally recognized non-profits, WISDOM helps to build homes, feed the hungry both locally and abroad, and take responsibility for Mother Earth by organizing community service initiatives. Help us make a difference in Metro Detroit. 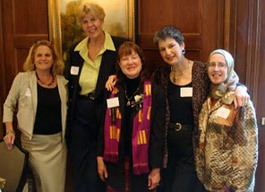 Come to our WISDOM events and meet women of different faiths, races and cultures. Learn about other faiths, explore the sacred, break down barriers while breaking bread together, empower yourself and other women. Share your talents, expertise and ideas in our efforts to cross divides and open hearts and minds. WHEN: May 2, 2019 at 5:30 p.m.